What is the art of Tai Chi Energetics? The Chinese concept of "Qi" (氣) is akin to that of a life force energy. For thousands of years, Chinese have developed numerous exercises, integrating body movements with breathing exercises to strengthen the flow of Qi, promote vitality and healing in the body. These exercises are broadly referred to as Qigong (氣功) or Neigong (內功) practices. Tai Chi (太極) is a martial art composed of various sequences of soft flowing movements. It works with the flow of Qi in the body and trains the body to move in a balanced and integrated way. Bernard’s Tai Chi Energetics classes provide a structured and evidence-based way of experiential learning about the traditional principles of Tai Chi and energetic Qigong practices. What are the benefits of regular practice? What does a session of Tai Chi Energetics with Bernard look like? Bernard’s approach is to provide a practice tailored in accordance with each student’s body conditions. His objective is to provide the student with simple tools and practices and allow the student to deepen the learnings over time and through regular practice. He empowers the students to define their own support system through martial arts, so that they can navigate through the daily challenges (whether at work or in personal life) with ease and grace. For a beginner, Bernard will start with the simple exercises like focused breathing, basic exercises and stance work to raise the student’s awareness of own sensitivity to energy. 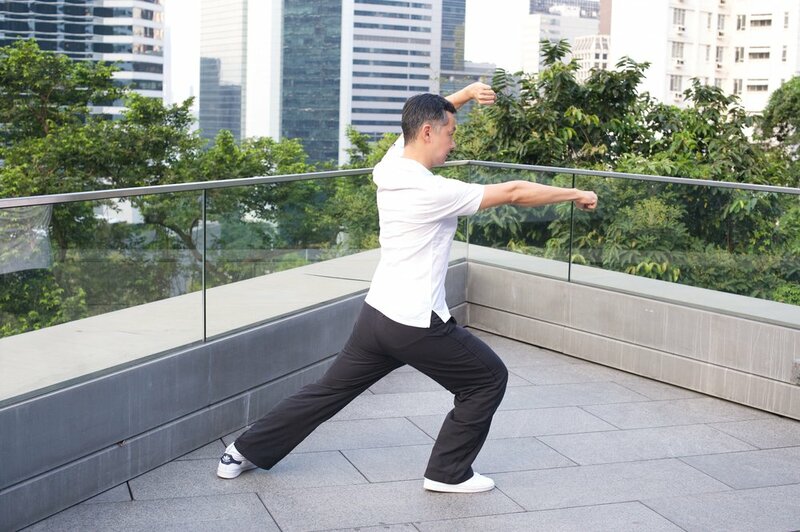 Where necessary, Bernard will incorporate certain Qigong movements into the practice to assist the student to deal with his/her own areas of focus (e.g. complications from past injuries, strengthening weak muscles etc.). As the student becomes more familiar with the basic practices – i.e. begins to move with a degree of fluidity and assurance – Bernard will introduce further applications and Tai Chi sequences. the practical application of the five basic elements of life – i.e. how the five elements relate to our physical and energetic anatomy (including, associated organ systems, meridians and accupressure points in the body). His teaching emphasises the path of the warrior, using martial arts as a spiritual and healing practice and a way to maintain peace and equanimity within oneself, regardless of how chaotic the external world may be. For the Weekly Small Group Class schedule, please check out "Events & Classes". For booking, cancellation and class pricing related information, please check out "Class Pricing Terms". Bernard has had a lifelong interest in philosophy, spirituality, martial arts and body work. His journey has led him to study many different paths such as yoga, Buddhist philosophy, meditation, Aikido, shamanism, Taoism and Chinese martial arts. In 2008, he sustained several serious injuries to his back – which led him to explore various modalities to heal himself on the physical and emotional level. 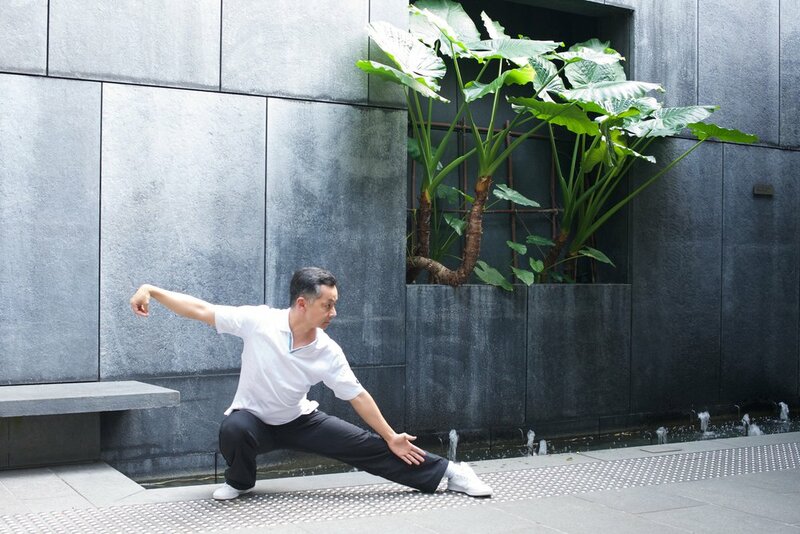 One of the key elements in his rehabilitation is Qigong and Tai Chi practice. Bernard was born in Malaysia, works in finance, read Politics, Philosophy and Economics at Oxford University and obtained a master’s degree in Buddhist studies from Hong Kong University. He has close to twenty years’ experience in Tai Chi, Baguazhang (八卦掌) and Aikido. It is a known scientific principle that all matter vibrates to a precise frequency and that by using resonant vibration, balance of matter can be restored. With this in mind, the Alchemy Crystal Singing Bowls Bowls and Tibetan Singing Bowls will enhance the effect of (a) calming all your senses and (b) stimulating the peaceful sensation and energy field around you. It is essential to engage a coaching arrangement when you want to be ahead of the game - whether for your own career development, business development or personal development. As a leader, coaching is an essential skill to improve employee engagement, reduce stress level and enhance performance. Meditation is the practice of techniques to train the mind and attain a state of consciousness, where we become aware of our thought and behaviour patterns in order to shift them for the better. In this modern day where stress management becomes a requisite skill, meditation practices is a useful and sustainable support system. Reiki I and Reiki II can be seen as the foundation for self-discovery, personal and spiritual growth. In this journey, you have learnt and applied the basic knowledge about energy and the techniques on activating and channelling Reiki energy. Aside self practice, you may have given people Reiki treatment. Or even better, you may have been experimenting with Reiki creatively. Reiki Level 3 Workshop is available on request. Please contact us at info@luxenova.co. Change is the only constant in the world. Instead of trying to resist the change, we should just flow with it and leverage the resources that are available to us. This is the essence of the Taoist principle of Wu Wei (無為i.e. non-doing). Living in the steroid-driven city like Hong Kong, people age faster as a result of the stress about themselves, the past, future and anything but the present moment. The idea of “non-doing” may seem to be an urban myth to many people. the yoga teacher is your equal partner in this journey, assuming the role of creating and holding a safe space for you to explore further in your own pace. Please contact us at info@luxenova.co to book your session. The value of what Reiki adds to our own life is beyond any words as it is gained through experience from receiving and giving Reiki. Whether you are a long-term Reiki practitioner or a beginner, in this journey of continuing personal development, it is precious and essential for us to practice in a group and a safe space. It is a great opportunity to exchange energy, ideas, tips and simply friendship. In particular, for those who tend to practice Reiki alone or gives Reiki to others, it is always beautiful to be receiving this intelligence energy vibration for yourself. The ritual of making a cup of tea is in essence a mindfulness practice. This ritual can be as simple as using a single tea bowl or an elaborate ceremony set up with an array of utensils. The sound vibrations from the crystal singing bowls will enhance the sense of wellbeing and deepen the internal connections. Mindfulness is a leadership competency and quality. It is a useful skill to stay balance, calm and focused, especially in the mist of constant changes and volatilities. Regular mindfulness practice can create the immediate positive impact. We work with our corporate clients to design such programme as part of the leadership development, especially from mid-ranking managers up to C-suite executives.